If Your Disc or Nerve is Under Pressure, Relieve it Using this Simple Exercise. Watch the Free Video Right Now. Stand Straight and Tall Again Using This Simple Exercise. 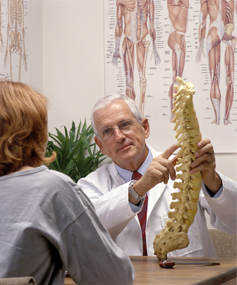 Pressure on the Spine Causing Sciatica & Back Pain can be Released. I need to send you a important caution associated with this video and so require you to register or confirm your previous registration before you watch it. You can unsubscribe immediately from the email I send if you wish. Please be assured your details will never be shared with any third party and every email you receive from me will have an unsubscribe link. Sciatic Pain is a very common back problem that takes in the sciatic nerve. The pain is felt into the hip or buttock or can travel down the leg and in severe cases can make it impossible for a person to be upright. Sciatic Pain or Sciatica as its commonly known, can be mild or extreme and can vary in its intensity from one day to the next. back pain is often a precursor for sciatica, but not always, but people usually only feel on or the other at any one time. Sciatic pain can be difficult to diagnose because it doesn’t always show up on an X-Ray or scan. Sometimes the scan can show a nerve being impinged but other times it doesn’t. One problem can be that the scan is taken when a person is laying down and this might be the most comfortable position for them to be in. It is only when they are upright that the sciatic nerve becomes trapped so the scan doesn’t show it. Most people can get relief from sciatic pain and nerve impingement in the spine by laying down and taking the pressure caused by the weight of gravity off their body. However in some cases it is very difficult to find a position that is comfortable due to the pressure from a disc bulge or muscle spasm that has built up on the sciatic nerve or spine. Sciatica, and most nerve problems in the back and spine are often brought about by weakness in the body and some sufferers can get relief by doing strengthening exercises, especially to their core. Many therapists will say that the Piriformis muscle is the primary cause of a persons sciatica (called Piriformis syndrome) but truth be known, rather than it being the cause of the problem it is just one part of it. What happens is the piriformis muscle tightens up because of the pressure being applied to it when the pelvis is not balanced. Working on the piriformis muscle is only a band aid solution for sciatica and often any relief it provides doesn’t last. The overall symmetry in the body has a lot to do with why the sciatic pain starts, meaning that whenever a person sits or stands, the muscle tension supporting the weight of gravity causes the whole structure to twist or sag. This comes about because the muscles on one side of the body are working differently to the same muscles on the other side. It’s this twist or sag that puts the spine under a lot of pressure leading to a disc bulge, disc herniation or disc prolapse, causing the sciatic nerve to be involved where it exits around the L4, L5 or S1 region of the spine. 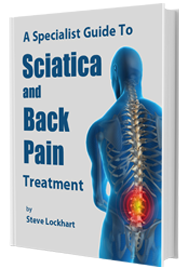 If you want a text book explanation of sciatica you could visit a site like medicine.net but if you were looking for practical ways to help you get rid of it you are likely to leave the site more confused than you are now. The Doctors or scientific view of sciatica is a very narrow one and when considering why a persons gets sciatica they usually put it down to it being a very isolated problem with a specific disc or nerve. This same story is repeated right across the net on all the big sites like spine health or myDr and even the Government sponsored sites like betterhealth. They talk a lot about the body’s structure and the actual nerve without really providing anything concrete as far as how you can get rid of the problem effectively – past surgery, drugs or stretching exercises, which most sciatica sufferers already know don’t work. There are various areas that you need to work on to take away sciatic nerve pain but generally an overall, full body approach is needed to re balance the muscle system and release the pressure from the disc bulge or disc herniation. It is this overall balancing that allows the spine to straighten and pressure to be released so a person gets their full movement and flexibility back. Exercises and stretches are what most therapists and doctors will prescribe as the best way to treat sciatica but these invariably irritate the problem because they are relying on healthy, responsive muscles being present and for a large majority of sciatica sufferers this is not the case. The full body, hands on approach taken by an SLM trained therapist can be very successful at finding and restoring function to muscles that have already shut down and this is a critical first step in removing muscle imbalances that cause a disc bulge, disc herniation or disc prolapse. Although SLM therapists can be hard to find a full list of available ones can be found here. Surgery, which is often recommended as a way to treat sciatica and disc problems,is a treatment for the symptom rather than the real cause of the nerve irritation. For this reason it is recommended that this option only be used when more conservative treatments have failed or when the pain is 24/7 and desperate measures are called for. When surgery is chosen it should always be done in conjunction with having the muscle system rebalanced to ensure the problem doesn’t return later. 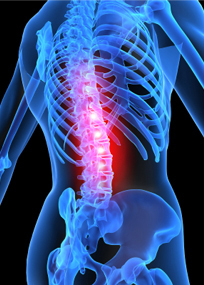 When the initial symptoms of nerve pain or sciatica are experienced it is advisable to search out an experienced therapist who is good at re balancing the muscle system so as to get pressure off the spine and discs. By quick action you can avoid the sciatic pain getting so bad that surgery becomes an emergency option. A great way to release pressure from the spine is demonstrated in a FREE video which outlines a proven technique you can do yourself at home. You can watch that video by providing an email address of where it can be sent here. This technique can very often solve the back pain or sciatica problem quickly and avoid a lot of time and expense seeing a therapist who will more than likely just be treating the symptoms. When you treat the symptoms of this problem and don’t get to the underlying cause which is usually muscle imbalances, you will only be getting temporary relief. This is like just replacing a tyre on your car that is scrubbed on one side without doing a wheel alignment. The new tyre might look ok for a while but would be under the same pressure and before long be worn out the same way. Finding the right exercises to do when you have sciatica or a nerve problem is very difficult because most will only irritate the pain. You need to look at exercising in the water or doing floor exercises such as yoga. When even these ones irritate it, then I recommend inversion therapy as the best way to go. By decompressing the spine and getting the pressure off the disc and nerve while you do some core strengthening exercises, you get the relief without the irritation plus a much stronger core which helps ensure the pain doesn’t come back. The book and DVD have arrived and I have tried the exercises for 2 days only and	not fully at that .While I am not wanting to get carried away ,some of my	worst pain has gone today and I have been suffering for more than a year and	paid out hundreds of dollars on treatment .If only this can continue !!	" I have been using your program for a month plus now & there is great improvement in	"my lower back. I am now able to walk for about an hour four times a week. For three	months before the treatment started I could barely put one foot in front of the other. Thanks for all your information,"
"Thank you for your help Mr Lockhart. My back has permanent damage but your instant relief method with the balls has helped	tremendously. Many thanks for your help.	" Thank you for all the help you have given through your emails. I actually live in England	but saw your site on how to help sciatica, so thought I would give the instant relief a go	as I had been unable to relieve the pain any other way. I was having chiropractic help	but did as you suggested with the balls and I found great relief from doing this exercise,	it really does work!! Luckily my back has returned to normal now but I continue to work	with the balls, so thank you again for the great help, so simple yet effective. Your treatment that I read about via the internet has worked miracles for me! I've had that	nagging achy lower back pain for over a year and then 1 treatment with the tennis balls	and the pain totally cleared up and I can do everything else I was doing again - I'm an	athletics coach amongst other things! best wishes	"
"Thank you for your email Steve. I have been really well with my back now. Your advice	and technical skill have helped me tremendously. Everything you wrote about in your	book proved correct, even about the doctors. Thank you again and keep up the good	work. "Thank you for your continuing advice which I have been reading in small bits. My self treatment has been successful so far with encouraging information from your video At the moment I am doing well and my sciatica has gone Just for your information...... I am nearly 83yrs....Had 2 hip replacements between 2005/6." Thank you for all your great tips , exercises and help guidance toward getting rid of my	pain without a need of anyone apart from doing what you suggests in your emails! Yours Sincerely,"
"I have been following you advice and getting great results.... The double tennis ball and roller have been very beneficial in the treatment and I an doing well. Thank you for your help." All of the information has been written by Steve Lockhart, the creator of the SLM Bodywork treatment method and a successful therapist with over 20 years practical experience at fixing all types of chronic pain.